Ada Colau - the radical mayor of Barcelona. PA images/Emilio Morenatti. All rights reserved.Since the late Middle Ages, cities in Europe have played a crucial role as places of production, craft, artistic and cultural creation, as nodes of extensive trade networks, and as spaces of individual and collective liberation from the previous constraints of servitude. Urban development has, since then, accompanied moments of historical progress on our continent. And cities are, at the same time, the stage and the main actor in any process of economic, cultural and societal transformation. In recent decades, after the end of the Fordist production model, new forms of work organisation - diffused, immaterial and networked - as well as the increasing financialisation of the economy that has led to land and real estate speculation, have again profoundly altered the nature, role and function of European cities. The combination of these processes has generated new contradictions, dramatic imbalances and growing inequalities which have in turn been exacerbated by the management of the crisis over the last eight years and by the consequences of austerity policies. But, at the same time, cities are the scene of resistance and innovation, often in terms of spontaneous ruptures: the place where social protests erupt and mutual cooperation unfolds, where street mobilisations and processes of cultural creation and productive innovation emerge. The European Commission itself has recently stressed the leading role of cities and metropolitan areas and the need for stronger coordination and exchange between them. More than 70% of Europeans live in urban areas, where 75% of energy consumption and 80% of emissions are also concentrated, placing them at the core of the environmental crisis. Such considerations are even more important facing the legitimacy crisis of EU institutions and of nation-states. Precisely in such a critical context, cities - as was the case in crucial moments of transition in European history - can play again a leading role. They could be places of radical innovation in politics, spaces of actual reinvention of democracy. And in this way they could provide answers to major challenges of our contemporary world. A long "municipalist" tradition is waiting to be rediscovered. This tradition seems today to relive in the experiences of new governments "of change." 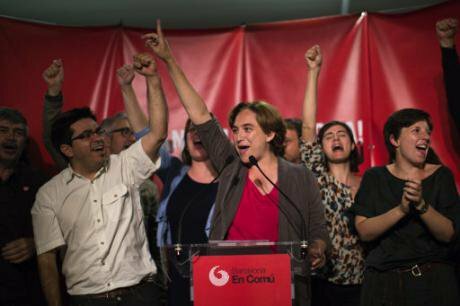 Most will know the “Plataformas ciudadanas” – civic platforms born from the 15M movements that have filled the squares of the Iberian Peninsula from 2011, and that won in the local elections of May 2015 in some of the most important cities in the Spanish State, starting from the election of Ada Colau as mayor of Barcelona, ​​Manuela Carmena in Madrid and then Valencia, A Coruna, Zaragoza and many more. In this first year of government such cities have already introduced important innovations in local government. They have focused on transparency and on returning to citizens' direct participation to the decision-making process. They chose to invest more resources in new welfare policies that counter the advance of mass impoverishment generated by the crisis. They intervened in urban planning, initiating housing policies more favourable to low-income residents. They have set up programs supporting a fairer and more inclusive social economy, by changing the rules of local tenders and procurements. They are trying to “re-municipalise” essential local public services, after the privatisation spree of recent years. They decided, even in contrast to national and European policies, to welcome refugees. And, on a national level, they are organising in a state-level network of “ciudades del cambio,” cities of change. What is happening in the Iberian Peninsula is the spearhead, both from a symbolic and a material point of view, of a "new municipalism” that is trying to reinvent democratic practices from the local dimension. But it is equally true that the whole map of Europe is dotted with cases of already established or embryonic initiatives, which are testing new possible relationships between citizenship and local institutions, searching for creative answers to the challenges of urban development and social coexistence. In this spirit, six months ago European Alternatives launched an early-mapping project on a European scale of the "cities of change", i.e. those cases where the initiative from below of active citizenship meets with innovative experiences of local governments. The first results are showing a field much wider than expected in the North as in the South, in the East as in the West. Here we can mention only a few examples: the cities of Birmingham and Bristol in the UK; the Land of Thuringia in Germany; a Mediterranean metropolis like Naples and a city at the foot of the Alps such as Grenoble; many municipal governments and two regional administrations, those of Attica and the Ionian Islands, in Greece; Polish towns such as Wadowice and Slupsk. Some of these first results were presented on May 19 in Naples at a first meeting together with Barcelona en Comù, which is currently conducting a quest for similar experiences. But we cannot stop at a simple, albeit necessary, photographic reconnaissance of what is existing. The experience of the last year has highlighted the limits and contradictions even of these alternative realities. The life of every territory is conditioned by huge interests, crossed by economic and financial flows that are out of local democratic control. The same relations between active citizenship and local governments often prove to be problematic. And legal and institutional constraints by higher levels, national and European, severely limit the range of action of even the most innovative municipal or regional administration. To prevent these problems inhibiting any real change, we think that two parallel strands need to be crossed and intertwined. First of all, organising the permanent exchange between these innovative local experiences as a mutual learning ground: the transfer of knowledge of single projects, or single civic participation models experienced by this or that city, can help to address and to resolve challenges and to adapt and improve practices already in place elsewhere. Secondly, the construction and development on a European level of networks between the "cities for change" can be decisive in increasing the potential of intervention and political pressure on national governments and European institutions. It can affirm a real protagonism of the communities and local governments in political decisions that affect them. In this perspective, the interaction with transnational movements and various initiatives "for democracy in Europe" (DiEM25, among others) is a necessary requirement. An example comes from the recent meeting of Local Authorities against TTIP, held on April 21 and 22 in Barcelona, which concluded with a strong call on the European Commission signed by hundreds of mayors. European Alternatives is now strongly committed to these goals. Because we share the thought of Lewis Mumford on the equivalence between the destiny of cities and the destiny of Europe, of which cities are constitutive and original elements. And in these turbulent times, a network of cities of change might just bring the rebelliousness needed to shift the fate of this continent.